Some birds may be in continuous flight for days or even weeks when they are crossing oceans or deserts or on a search for food. But animals cannot usually survive for so long without sleep - so what do the birds do when they are unable to land and rest? A recent study measured the brain waves of birds that flew ten days without landing, and found that they are able to sleep during the flight - but for a very short time, and often with one eye open. Sleeping "with one eye open" means only one side of the brain shows the characteristics of sleep brainwaves, while the other side stays alert and responsive to the environment, which has been previously observed in some birds and marine mammals. Ducks, for example, are able to sleep with only one side of the brain when many predators are near, and they must stay alert at night and be ready to flee at any moment. Dolphins, sea lions, seals and many others use this form of sleep to continue swimming while sleeping. To find out if this is the case in our long-flight birds, Niles Rattenborg and his fellow researchers from the Max Planck Institute for Ornithology in Germany chose to study the Fregata minor birds. 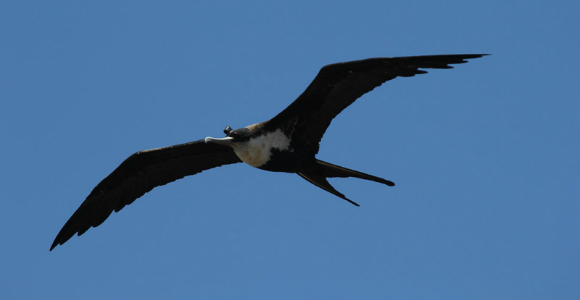 The group chose this breed from the Galapagos Islands for their investigation because of their long hunting missions over the Pacific that can last for days or even weeks. The researchers attached electroencephalogram (EEG) devices to the heads of the birds, and brain waves were measured separately on both sides of the brain. In a paper published in the journal Nature Communications, Rattenborg showed that these birds are indeed able to sleep during flight. The birds only slept during the night, and only when gliding i.e., they did not when they had to move their wings. In contrast to a bird's normal sleep when they are resting on the ground, in the air most of their sleep was a one-sided-sleep, in which only one side of the brain sleeps, probably to monitor the bird’s surroundings and ensure strong winds still carry them. However, occasionally gliding birds also fell asleep completely with both sides of the brain, and it seems even dreamt from time to time - the EEG showed activity equivalent to that which represents dreaming in humans. The most pronounced difference the birds displayed between time spent resting on the islands and time spent flying was in the amount of sleep. While on the ground the birds slept on average more than 12 hours a day, compared to the days when they were in the air and made do with an average of 42 minutes. The question of how they survive with so little sleep remains a mystery. After all, when the duration of a human’s sleep is drastically reduced, even for one night, one would have great difficulty staying alert and can even fall asleep at the wheel or at work. Prolonged sleep deprivation, such as that seen in the Fregata birds, would damage the health of humans, and probably most other animals. The researchers plan to further investigate what allows birds to survive on so little sleep, and may shed light on the explanations for sleep itself – something that we do for about a third of our lives, yet still remains a mystery to us.